If so, put “grocery divider” in the search bar and take a scroll through the results. It may have been a joke, but the 1,700 comments and 48,000 retweets, not to mention the 261,000 “favorites” show the staying power this idea has. …it mostly has references to the idea that the use of a grocery divider (especially the rush to get the thing down as quickly as possible) is a microaggression. I’m not qualified to give a microaggression primer, but here’s a bit of background. There are some evocative examples here (chosen by me partially so I could give a shout out to my former employer, Fordham University!). And Psychology Today breaks microaggressions down into three categories: microassaults (read more about those from Sailing Rough Waters), microinsults (more on those here, also from Sailing Rough Waters) and microinvalidations (more on those in this Teen Vogue op-ed). Perhaps I am speaking out of both sides of my mouth by saying what I am about to say. Maybe it’s hypocritical to argue that it’s silly for one Tweet to “stick” so deeply with so many people yet spend an entire blog post writing about it. But writing is how I sort things out (and try to encourage others to think critically), so here goes. The use of a grocery divider on my part is just that … a lifelong habit grounded in an attempt to be courteous, informed by my high school experience as a grocery cashier and driven by the fact that I am ready to get out of the store. That’s it. End of story. Not intended to be a microaggression. First, I think about this every time I am at the store. Cashier: No comment, neutral reaction. Me: There’s all kinds of talk on Twitter about how ridiculous it is to put the grocery divider down. Him: It’s just what people do to separate their groceries. No big deal. Second, isn’t it crazy how the grocery store is the microcosm that puts our behavior in perspective? It’s insane (and possibly a sign that I could organize my life better) how much time I spend at Publix. I’m there multiple times per week. Third, the divider is a practical matter. When I was buying supplies for a business-related occasion while using my corporate American Express card, my daughter put a fountain drink she had gotten at the deli on the belt, and it was accidentally with the business items vs. our personal items. When it was discovered that I had spent $1.75 (or whatever) on a personal soda, I had to repay the $1.75 (fair enough) but the card was also locked up in the CFO’s office and I had to check it out every time I traveled on business (which at the time occurred frequently). The only solace is that the same thing happened to one of our most senior leaders, because he accidentally paid for his Firehouse Subs lunch with this corporate card, which was located next to his personal card in his wallet. Side note: neither of us works there anymore. Fourth, it isn’t just Twitter. Fifth, it’s hard to talk about these types of things productively. I thought I could ask a question about this topic (of the idea that using the divider is a microaggression) in a private group I’m in that contains an amazing, diverse assortment of people committed to discussing race, how white people can be aware of white privilege (and address it), and many other things. I deleted the entire thread and spent the rest of the evening wondering about the set of interactions and wishing we could have finished the discussion. I DM’d the person who challenged me, explaining why I had taken the thread down (basically, that I didn’t want to alienate anyone) and have not heard back from them. In writing this post, I worry I will undo any good I did (if there was any) by writing We Have to Talk About White Privilege. If you are someone for whom use of the grocery divider feels like a microaggression, I respect that. I have read someone I respect a great deal, Shay Stewart-Bouley of Black Girl In Maine, say that the work of coming to terms with racism is both internal and external. I wholeheartedly agree. When I rush to put the divider down at the grocery store, my intent is straightforward: I don’t want to accidentally pay for someone else’s items (the budget is tight) and I don’t want to add stress to the cashier’s job. Why eat up extra minutes having a transaction voided when I could better spend my time and efforts trying to do something that really makes a difference? I am linking up with Kat Bouska, for the prompt “Share something that entertained you this week, can be an article you read, video you watched, someone’s FB share…whatever!” Although, to be clear, “entertained” isn’t exactly what this topic did for me this week. Most of the time, I feel like my spirit is younger than my physical age. My body, however, insists on exhibiting signs of middle age no matter how youthful I feel at heart. I have been getting my brows waxed for years; it’s more effective and quicker than tweezing. That didn’t feel like a concession to age, more of a perpetual necessity. A few years ago, I began having my upper lip waxed. This was not that welcome an addition to my beauty routine, and it never really feels like it works (I watch myself on video, for example, and think how do I get rid of that dark area?!?!). The clincher in the hair removal trio, though, was the day the technician said, “you’re gonna do your chin too, right?” Apparently I was. I became accustomed to having three services instead of one, and I usually did a pretty decent job of putting the whole thing in the “it is what it is” category. I tried to do it once a month, but let’s be honest. I work at home, don’t go out all that much, and it’s easy to let the intervals between waxing grow much longer. Until I am about to participate in an event, see someone I don’t see often, or have some other motivation to take care of it. That’s what happened recently. It was Friday, and I had plans to go see my good friend play Edna Turnblad in Hairspray. It is absolutely zero exaggeration to say his Edna would put most of us ladies to shame. I couldn’t show up with a hairy chin. Time was running short until I had to leave to drive to the performance (a couple of hours away). I finally finished the day’s work, and had run out of time to go to my usual waxing professional. I only had time to go to the closest salon, which has never been my preference but works in a pinch (they did okay on my shellacs, for example, prior to my trip to DC for the Shot at Life Summit last March). I walked in, asked if anyone was available to do some waxing, and was immediately taken back. I was relieved that this was apparently going to be a quick in and out, permitting me to get on my way to Lake City. The technician waxed my eyebrows. So far so good. The technician waxed my upper lip. Check check check. The technician waxed my chin. Easy peasy, right? Here’s the thing. She kept going. This woman was applying wax and yanking the strips off of areas of my face that had never seen wax (or hair to speak of) before. My mind was racing. Why is she waxing my cheeks? When will this end? In my head, I kept hearing my mom telling me, when I was a kid and wanted to start shaving my legs, “once you start the hair will grow in darker if you let up.” OMG were my cheeks now going to start sprouting dark hair? What had I done by coming here (and by not stopping this woman when she ventured away from the brow/lip/chin trio)? Finally, she applied lotion and cooling solution (which I desperately needed by this point) and with relief I followed her to the front desk to pay. I do not know what the person at the front desk said (they were not speaking English), but apparently she did not think the technician had done enough (in retrospect this boggles my mind), but through hand gestures and body language, she indicated that I needed to return to the waxing room. And despite the fact that my face already felt like it had been through the wringer (it had! It would have been more efficient to just drip my whole darn face in a vat of wax), I went back. When I went back, the technician attacked my chin again (“attack” being a truly representative word). Finally she let me go and I didn’t ask any questions as I hastily escaped out the door. As I write this (8 days later), it is ALMOST fully recovered. As the week went by, I was trying to figure out what to do (short of the obvious decision to remove this salon from my “waxing vendors” list). I thought about the customer service issue I had had at Publix that same weekend. I had ordered my daughter’s birthday cake several days in advance, and a few hours before it was to be ready, they called to say they didn’t have that design. I exchanged messages with them on Twitter to express my dissatisfaction (tactfully). I went to another Publix to look for it. I went (ultimately) to my Publix and talked with the bakery associate, who wrote the message on a different cake. I worked with Publix to make it mutually right (as much as possible). I kept telling my husband that I was afraid to talk to the salon. I was afraid the technician would lose her job. He pointed out that I was physically injured but protecting her from losing her job (while putting other customers potentially at risk). HMM. Why did I feel I could dialogue with Publix but not with the salon? Had I made assumptions about the cultural environment at the salon? The more I thought about it, the more I decided I at least needed to let them know (and save some other customer from rug burn chin). 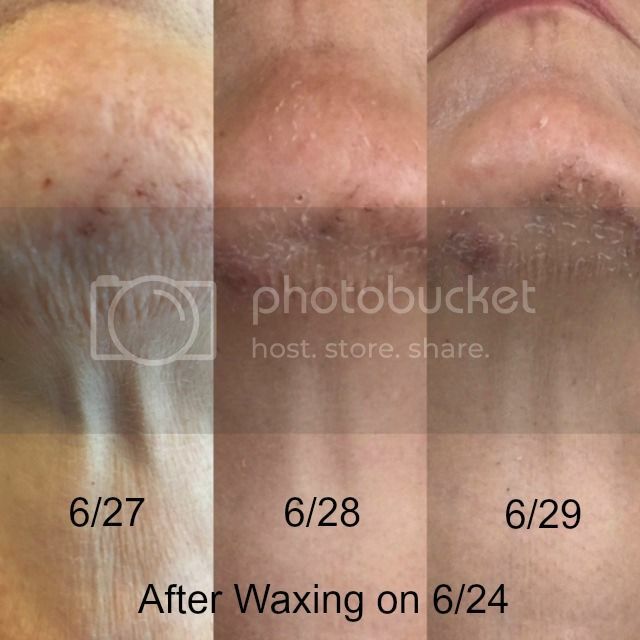 When I went in, I explained that I was not upset (yeah, I know — I was upset and I shouldn’t have started with that line but personal assertiveness reform happens incrementally) but that I wanted to point out the condition of my chin. They were apologetic, offered to put cooling solution on it (no thanks, a little too late for that!). They said the wax had been too hot (ya think?!). I don’t know if my decision to talk to the salon will change the outcome for future customers, but in a week when I had just written about the necessity and power of saying what you mean, it felt hypocritical to keep my mouth shut. I read a post recently that pointed out: “When you speak assertively, you may not always say what people want to hear, but you respect the listener as well as yourself.” There’s so much truth to that. When I used this situation as the basis for a recent Toastmasters speech, the takeaway was the fact that although “taking it on the chin” is perceived as a negative, in the case of the overzealous waxer, I would have been better off to take it on the chin (instead of the cheeks and other facial real estate)…and then tell her to stop. And certainly not go BACK to the waxing table, like a sheep. Have you had a time in your life when you needed to say no but struggled to find a way? I’d love to hear about it! NOTE: This situation has made me think about how blithely we walk into salons, thinking “what could possibly go wrong?” My fellow Paula (Abdul) probably has a thing or two to say about that (read more here). As it turns out, it’s pretty challenging to find a “guide to competent waxing” resource (future blog post material? ), although this post shares some helpful precautions and warnings. In my case, common sense and speaking up would have solved the problem. Those are two things that don’t require a licensing board. It was a rushed moment during a tiring evening. My mother in law and I had spent an intense hour and a half at Verizon navigating the purchase of an iPhone for her. We dropped by Publix for some prescriptions she needed. I asked to stop right before entering the store to return a call to my husband. Our little party was standing there, her holding my elbow (she was blind and that is how I assisted with her mobility), clutching her new iPhone so it wouldn’t get stolen, me on my iPhone trying to explain to my husband that we were not at all done with our errands yet (he wanted food…..). At some point a mom and her two kids walked by. One child was walking; the other was maybe 8 or 9 months old (? ), sitting in a stroller. I smiled at both kids and their mom, and the baby waved at me. 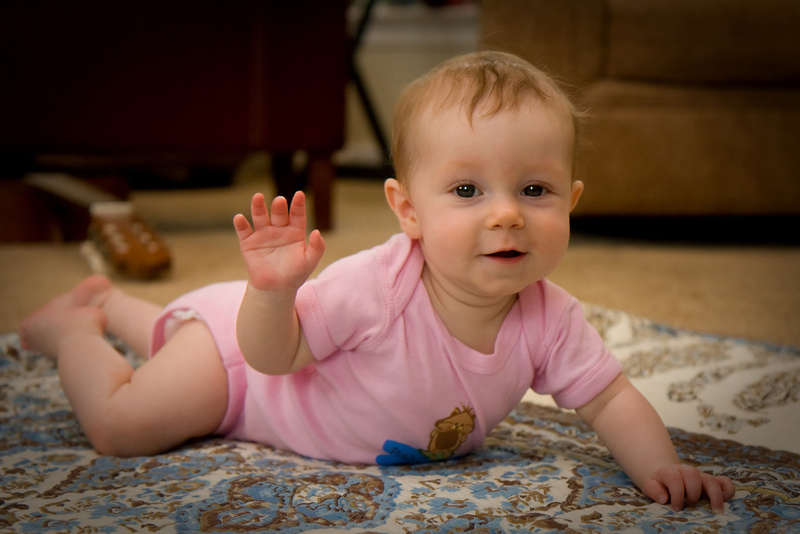 The mom was surprised and said to her infant, “it’s your first wave! !” She and I shared a quick silent “oh my gosh” moment — I couldn’t get off the phone and she had to concentrate on foot traffic but two moms were happy in that instant …. which all passed unceremoniously in a matter of seconds in front of Publix. Even though I was a stranger to that child, I was still elated to witness some else’s child’s milestone and his mother’s happiness. I am just as elated to know that children around the world can have the opportunity to hit their own milestones because of receiving access to immunizations. Although one child currently dies every 20 seconds from a disease that could be prevented from with a vaccine, Shot at Life can change that by helping children get vaccines to survive…and thrive. During Shot@Life’s Blogust 2014—a month-long blog relay—some of North America’s most beloved online writers, photo and video bloggers and Shot@Life Champions will come together and share stories about Happy and Healthy Firsts. Every time you comment on this post and other Blogust contributions, or share them via social media on this website, Shot@Life and the United Nations Foundation pages, Walgreens will donate one vaccine (up to 60,000). Blogust is one part an overall commitment of Walgreens donating up to $1 million through its “Get a Shot. Give a Shot ®” campaign. The campaign will help provide millions of vaccines for children in need around the world.